Last night was a spectacular evening. I am lucky enough to be a part of a show that started about 5 years ago. 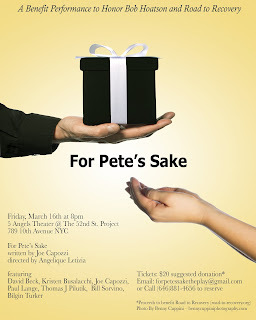 For Pete's Sake written by Joe Capozzi and directed by Angelique Letizia is a play about a personal journey and search for the truth that lies within ourselves. It's definitely a thoughtful and powerful play based on Joe's life. I get to be different characters throughout the play. We've done the play as a reading, a full production, a reading, and then again last as a full production. Wow, what a night! It went spectacular!!! Sold out show!!! Great, great, great!! !